Holding the carre upright or slightly slanted, you can draw using the 8 angles at the end (allowing you to sketch and structure the drawing). Can be used with any types of grained papers (especially semi-colored papers), canvas or surfaces with an uneven texture are perfect. 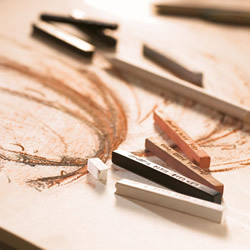 The full range of The Sketching Range of Conte Carres available individually. 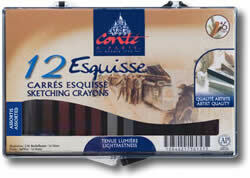 A compact little set of 12 mixed crayons from the Sketching Range.